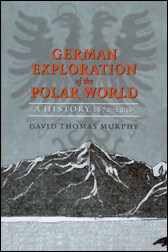 German Exploration of the Polar World is the exciting story of the generations of German polar explorers who braved the perils of the Arctic and Antarctic for themselves and their country. Such intrepid adventurers as Wilhelm Filchner, Erich von Drygalski, and Alfred Wegener are not as well known today as Robert Falcon Scott, Roald Amundsen, Ernest Shackleton, Robert E. Peary, or Richard E. Byrd, but their bravery and the hardships they faced were equal to those of the more famous polar explorers. In the half-century prior to World War II, the poles were the last blank spaces on the global map, and they exerted a tremendous pull on national imaginations. Under successive political regimes, the Germans threw themselves into the race for polar glory with an ardor that matched their better-known counterparts bearing English, American, and Norwegian flags. German polar explorers were driven, like their rivals, by a complex web of interlocking motivations. Personal fame, the romance of the unknown, and the advancement of science were important considerations, but public pressure, political and military concerns, and visions of immense, untapped wealth at the poles also spurred the explorers. As historian David Thomas Murphy shows, Germany's repeated encounters with the polar world left an indelible impression upon the German public, government, and scientific community. Reports on the polar landscape, flora, and fauna enhanced Germany's appreciation of the global environment. Accounts of the indigenous peoples of the Arctic, accurate or fantastic, permanently shaped German notions of culture and civilization. The final, failed attempt by the Nazis to extend German political power to the earth's ends revealed the limits of any country's ability to reshape the globe politically or militarily.